I have said before that Brahms is not one of my top 10 favorite composers. That is not to say that I don't love some of his music. But what I find most common in his compositions is difficulty in holding the line from start to finish. My mind tends to wander away from the music and I don't always stay engaged. These sonatas for cello and piano are interesting in the context of historical value as well as romantic style of expression. These two pieces are early works from Brahms. Prior to this, pieces for cello were written in a much more archaic structure. 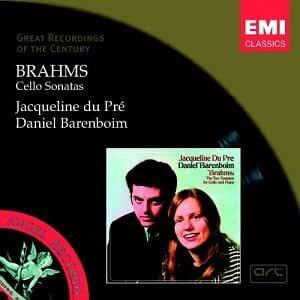 Brahms contributed greatly to the evolution of the cello to be played in a more expressive style. Jaqueline du Pre was a gifted cellist who swayed heavily when she played, using the entire bow and enhanced the music she played in a romantic style. Barenboim is also considered a romanticist when it comes to his expressive piano playing. Together, they successfully merged to perform these vibrantly warm sonatas. Barenboim and de Pre married and these two sonatas were the first pieces they recorded together. Sadly, de Pre was stricken with Multiple Sclerosis and her cello career was cut short by this debilitating disease. She died at the age of 42. So from the perspective of both the piece itself being a revolutionary style written for romanticized piano and especially cello, plus the recording by de Pre being unique and legendary, this CD is worth not only owning but listening to. This is a knockout. Du Pré and Barenboim dig deeply under the surface of these sonatas. I was struck by what a gritty sound Ms. du Pré goes for, especially down low on the C string, when the music calls for it. She was obviously capable of a "prettier" performance, as many passages of sheer tonal beauty reveal. But these are fearless renditions, played with abandon, with nothing to prove except to find where this music lives. Barenboim is a more than capable partner, though unlike other reviewers, I find his role to be further in the background than in many performances of this music. Not to worry, though -- du Pré more than fills any sonic void. The background story of this partnership and these recordings is the stuff of legend, but the depth of commitment to revealing this music is what's really important here. I love this CD.